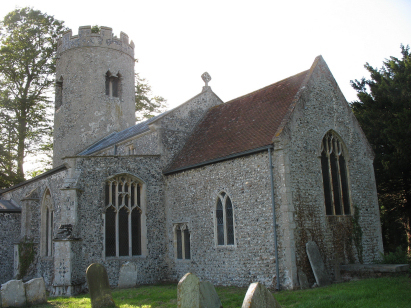 The parish of Aslacton lies in central southern Norfolk about 4 miles southwest of the large village of Long Stratton. Aslacton is a small village sitting just to the west of the main Norwich to London rail line in an area of intensive agriculture. Much of Aslacton is built around its main crossroads and in recent times the village has spread becoming almost contiguous with nearby Great Moulton. Aslacton sits almost at the headwaters of the infant River Tas which runs a half mile north of the village and sits on the edges of a large plateau-like area of arable fields to the south land is almost flat for many miles until reaching the Waveney valley, a cereal grower's paradise of large fields and open skies. St Michael's church sits at the village's main meeting of lanes sitting within the junction of lanes leading to Bunwell and the Forncetts. 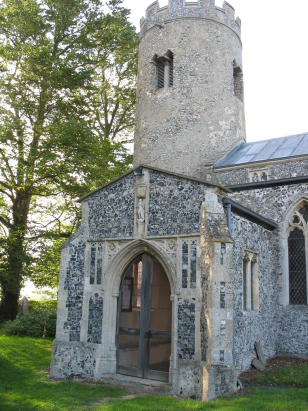 The round tower is immediately alerting to an early date and in this case Pevsner confirms that the tower, and a portion of the chancel, are Anglo-Saxon in date. Pevsner does not give a date but the tower is almost certainly pre-Conquest. The remainder of the building is fairly typical Norfolk Perpendicular albeit impacted by a restoration from the late 1880s. The building is protected from the road by a hedge-topped bank and sits in a well wooded churchyard, in particular the trees group closely around the west end making for a difficult piece to photograph. A single standard 800-entry register book covers the period of this transcript and runs onwards to finish in 1889. This register is filmed on Microfilm MF1684 in the collection of Norfolk Record Office. This film is a fairly recent one and benefits from the improved techniques and hence quality of recent production. As a consequence this was a straightforward piece to prepare albeit with some caveat as to the handwriting and a somewhat cavalier attitude to dating sequence, many entries appear out-of-sequence datewise as if added from supplementary notes and 2 entries are missing dates completely. Gaps in the numbering system are caused by starting a new page on occasion for a new year.